Most people hate taxes – that’s why they should love ETFs. Here’s what I mean, “About 50% of all equity mutual funds paid out capital gains in 2013, whereas fewer than 5% of ETFs did, and rarely did ETFs pay gains that were significant” …that’s a quote pulled directly from piece titled A Comprehensive Guide to ETFs, that Matt Hougan, Dave Nadig, and Joanne Hill put together a few years back. If you can find updated numbers on this please pass along. Our objective is not to restate the fact that ETFs are more tax efficient than mutual funds, but to explain why that is. Creation, redemption, APs, baskets…. we are going to cover some stuff. We are going to do so by walking through a simplified example of a custom redemption, don’t worry, we will break all the jargon down. ***One point to make clear before we move on – When an AP creates or redeems an ETF it happens in units of typically 50,000 shares. 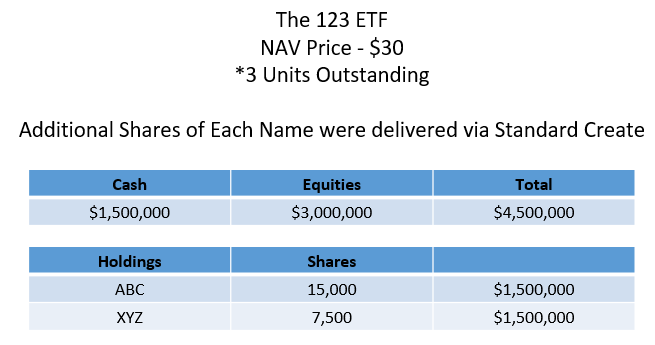 In summary, ETFs trade in both the Primary and Secondary markets. Why does that bring potential tax efficiency to the table? To answer that, we have created a simple custom rebalance example to walk through. Now, let’s assume the portfolio manger decides to remove ABC from the fund. On top of that, ABC has an unrealized gain that the portfolio manager would prefer not to realize and distribute to shareholders. In order to facilitate that, they call up an AP to help with a custom redemption – this is typically a 3 day process. 1 Unit = 50,000 shares An AP delivers the basket of Tickers and Cash and in turn receives back 50,000 shares of the fund. The Value of the “In-Kind” Transaction is $1,500,000 ($30 NAV x 50,000). This is a typical or standard Creation. Everybody still with us…ok good, we will keep moving. That’s a basic look at a custom redemption, the process that creates tax efficiency for an ETF. To summarize, the portfolio manger was able to remove a position with a large unrealized gain through redemption, a non taxable event. Pretty cool stuff. Now, you’re an expert in ETF mechanics and will be able to explain WHY ETFs are more tax efficient vehicles. There’s a lot more we could cover, but I’ll shut up for now! Thanks for reading.